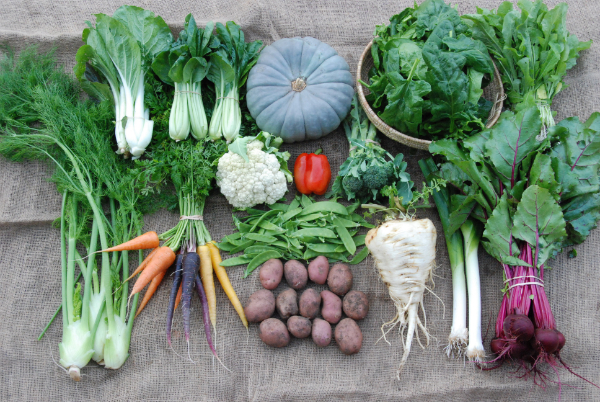 ELEVENTH WEEK OF THE AUTUMN SHARE We have finished writing the survey to help us understand your families vegetable needs and also gain more insight into how we can grow better. We thank you in advance for taking the five minutes to complete it. This will be emailed in the next few days. NEWS FROM THE FARM We have long wanted to incorporate chickens into our farm management plan. With the increase of snails in our leafy crops, Peter has devised and is in the process of making a chicken trailer that is the same width as one of our planting beds. The chickens will hopefully be safe from the many foxes that frequent our property while they free range through the spent vegetable beds, eating leftover greens, snails, slugs and other critters. We hope that this will not only increase the soil fertility, it will also increase the quality of the organic produce we are growing.With our season coming to an end, we will be filling your boxes with everything we have left growing. We envisage that much of this produce will last for a few weeks. This week there are big bags of spinach.